It’s been a few months since our last newsletter and now that winter is settling into the valley, we’ve finally slowed down and have some time for an update. Of course, we hope you’ve all enjoyed the spectacular colors on display in the creek bottom as you’ve been busy finishing up projects and preparing for the snow that’s now blowing through. The white is starting to drape the valley in its cold hush, and the creek will soon twist and slip under a skim of ice. As we dig in for the long winter ahead, please take some time to enjoy the creek and the valley and be thankful for all of life’s wonders. Welcome to our second issue of the Rattler, the newsletter of the Rattlesnake Creek Watershed Group. We hope you enjoy the read. It’s been a busy summer and fall for the RCWG. Our “new” coordinator, Katie MacKendrick continues to inspire the Board and community with her dedication, creativity, and work ethic. Since our last newsletter in July, we’ve continued our good work in Bugbee Nature Preserve. This small, but important nature area just north of Greenough Park has been a focus of the RCWG since our inception in 2008. 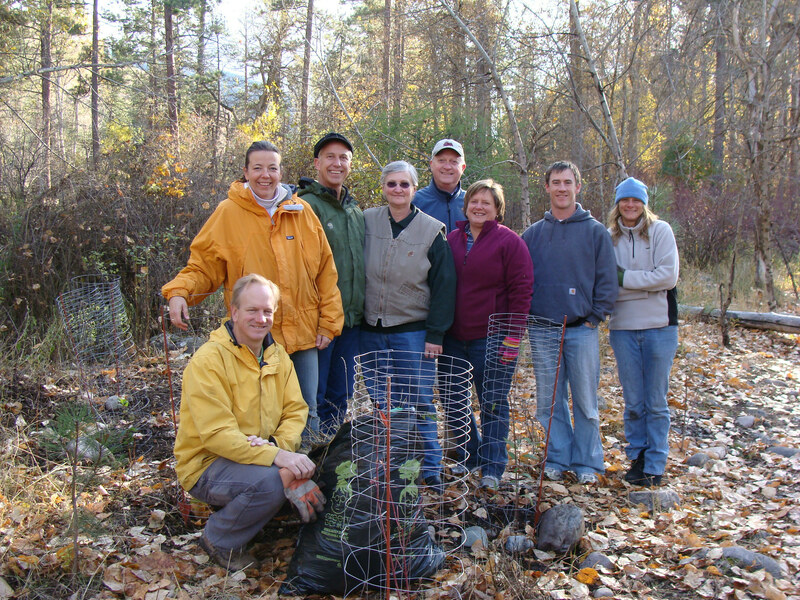 In fact, restoring a native plant community to Bugbee was the original goal of the RCWG and the genesis of the group in 2008. After a busy and productive work day this spring, we returned to Bugbee in July and August with help from the Inner Roads Youth Program, Youth Homes/WEN, and the Liam Woods Fly-Fishers Camp/WEN. The groups weeded, watered, and clipped and bagged tansy seed heads. As an all-volunteer group with limited resources, the help these groups offer us and the creek is crucial to the success of our efforts in Bugbee. Between the invasive plants, the deer, and the fickle weather, native plants in Bugbee have a difficult time getting established. A little water and some release from competition in the heat of July and August can really make a huge difference to the plants. Thanks to all for the help. Hope to see you next year. 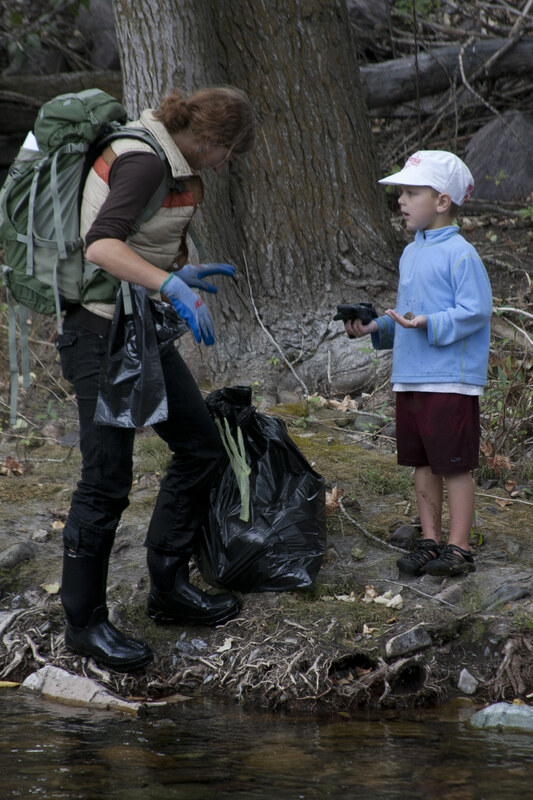 RCWG Coordinator, Katie MacKendrick and a young volunteer cleaning the creek. conducted a clean up along the lowest portions of Rattlesnake Creek. Volunteers pulled 600 pounds of trash from the lowest reaches of the creek, and hauled it off to the dump. No that was not a typo, this industrious crew pulled 600 pounds of debris from the banks of the creek south of Highway 90. While the upper 20 miles of the creek flow through Wilderness and Lolo National Forest, the bottom five miles flow through a mix of private and public land. Fortunately, landowners work hard to keep trash and debris out of the creek. Unfortunately, the final mile of creek runs through a very urbanized portion of Missoula where trash from encampments, the highway, and dumpsters often ends up in the creek. This was our second September creek-clean up and we’ll have another one next September too. Keep an eye out for the details. Thanks so much to Montana Watercourse for supporting the clean-up event. And, thanks to Professor Vicki Watson, UM students, and community volunteers who helped with the clean up, and Allied Waste for letting us dump the trash at their facility. To read more about this year’s Rattlesnake Creek Clean up, click here: For the Sake of the Rattlesnake – you’ll find a great article written by UM graduate student Emily Wendler. You can also visit our Facebook page to view pictures from the event taken by UM student Thom Bridge. 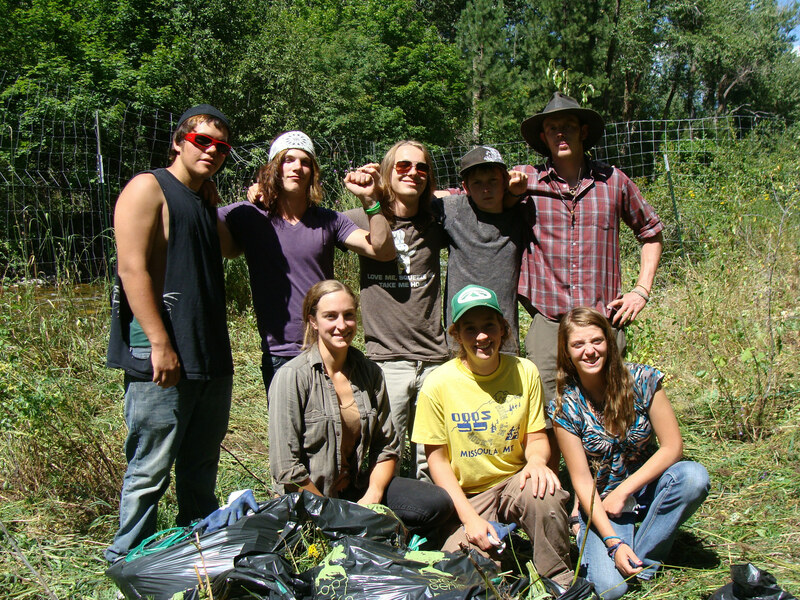 Thanks to the generous support of the Centennial Rotary Club of Missoula, RCWG and Sussex School are collaborating to carry out an education project focused on watershed restoration and monitoring in Bugbee Nature Preserve. 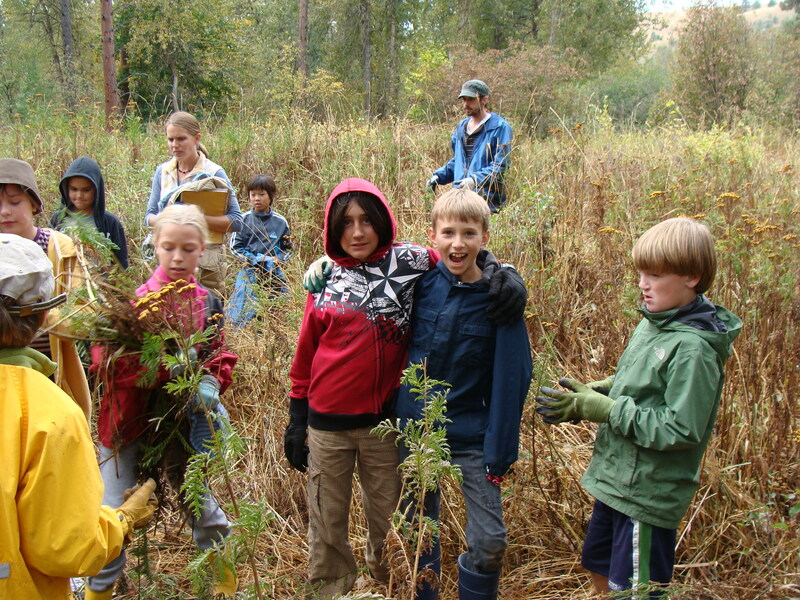 Forty students, grades 3-5, are participating in monthly lessons learning about the scientific method, plant communities, fisheries biology, hydrology, geography, and different approaches to riparian habitat restoration throughout the 2011-12 school year. As part of the lessons, the students are helping to design and implement different research protocols, collect data in the field, and work with the information to assess best management practices for riparian habitat restoration in Bugbee. Throughout the 2011-12 school year, the students are evaluating removal techniques for invasive tansy (Tanacetum vulgare), browse protection techniques for native riparian shrubs and trees, and planting maintenance techniques such as weeding and watering for planted natives. They are also mapping the extent of Norway maple and ponderosa pine trees. The data students collect will inform a Missoula County Habitat Management Plan for Bugbee, which the RCWG and Missoula County are working to draft cooperatively. Kids from the Sussex School help out in Bugbee. Just last week, RCWG’s coordinator, Katie MacKendrick, and Sussex School’s volunteer science educator, Julia Baggerly, worked with 1st and 2nd graders at Sussex. The students learned about the water cycle and the importance of keeping toxins out of storm drains, and created posters highlighting this important part of keeping the creek (and groundwater) free from toxic pollutants. If there are any businesses or organizations in town that would like to display these posters, please get in touch with Katie. As with all of our projects, we welcome community support and participation. Contact the RCWG to learn more about how to get involved. These past couple of years have been exciting and busy for the RCWG. Our all-volunteer board and our volunteer coordinator have shown impressive dedication and interest in fostering a healthy Rattlesnake Creek and an informed and engaged Rattlesnake community. As we’ve grown and expanded our role in the community, we’ve gained and lost board members and we’re always looking for new folks interested in lending their energies to our group. If you’re interested in helping out, please reach out to Katie MacKendrick, our coordinator. We have other non-board positions to fill too, including roles on one of our three volunteer, citizen committees: Fundraising, Stewardship, and Citizen Science and Education. We could also always use help of the financial kind. While we’ve received a few grants here and there, we’re a community group of volunteers. As the year nears its end, please consider giving to the RCWG. We are an official 501(c)(3) and can provide tax deduction documentation for your donation. Please explore our website to learn more about our work, and please donate to support us today! Seeing wildlife out your front door is undeniably one of the best aspects of living in the Rattlesnake. Whether it’s an owl family nesting in an old ponderosa snag, or a white-tailed deer munching on your peas, there’s certainly some unique wildlife viewing opportunities afforded Rattlesnake residents. However, with these opportunities come responsibility, especially regarding one of the ‘Snake’s largest wild residents: black bears (Ursus americanus). On October 13th, Rattlesnake residents had a great opportunity to learn about co-existing with these local bruins who often frequent yards and natural areas in the Rattlesnake from some local bear professionals. Bears are constantly working to find food. If they learn a source of food is easy to access, they will return to that source again and again. Bears become problems when they associate people (and their homes) with food. Keep food away from bears! This means garbage, bird seed, chicken feed, fruit, fertilizer, pet food, and anything that could even remotely be considered food. It’s now illegal to leave these items out and unprotected from bears. Please pick up fruit in your yard each fall. Bears (and others) will stuff themselves with fallen fruit to pack on pounds as the winter approaches. Leaving fruit on the ground will present a pretty tough opportunity for any bear to pass up. If you don’t have time to collect the fruit yourself, please enlist the help of the community in collecting and processing your fruit before you attract a bear. Put a post on Craigslist or place an ad in the Missoulian. There’s lots of folks in town who would be happy to help in exchange for some delicious fruit. The Great Bear Foundation has an “Apples and Bears Program” specifically designed to help, and Garden City Harvest and Opportunity Resources can also help. Just give them a call. Again it is now illegal to leave fruit in your yard. Utilize community resources. 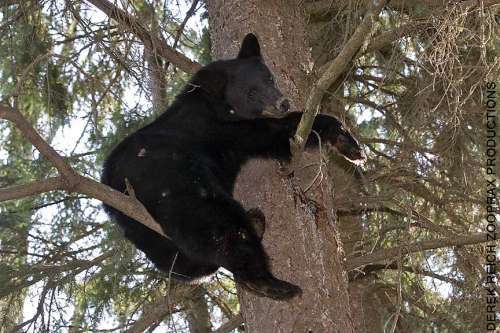 Check out Montana Fish Wildlife and Parks for information on living with bears. In addition to great articles on traveling and camping in bear country, they have a site for homeowners- just click here. Missoula’s own Great Bear Foundation, run by the venerable Chuck Jonkel has a host of resources available for helping us live with bears. MissoulaBears.org has a host of great resources including this link to a great overview of how to live with bears in Missoula, which lists pertinent city ordinances, useful contacts, and suggestions for good bear behavior. Finally, if you don’t believe that the potential for problems exists in the Rattlesnake, check out this summary of bear incidents over the past few years. http://missoulabears.org/September2011alerts.html. Help the RCWG create a Rattlesnake Bear Working Group in the Rattlesnake. We’re working to pull together a group of interested citizens to help work with Allied Waste, the Upper and Lower Rattlesnake Neighborhood Councils, and other organizations to create awareness and implement strategies to minimize bear-human encounters. Katie MacKendrick will be at the Lower Rattlesnake Neighborhood Council meeting on December 7 with materials and information on the group and bears in general. If you can’t make the meeting, please contact Katie for more information. Do you ever wonder how all the critters living in the Rattlesnake survive the long cold winter? Us too. Although they venture out when the weather permits, squirrels, chipmunks, and other small rodents generally hide out in their nests during the nasty winter weather, living off of the nuts and seeds they spent the summer collecting. During the coldest weeks of the year, they may slip into what scientists call torpor, which is somewhere between hibernation and sleeping. Body temperatures drop during torpor, reducing metabolic needs, allowing critters to use little energy but maintain health for days or even weeks at a time. Mice and voles spend much of the winter burrowing underneath the snow – in the subnivian layer – munching on plant roots and stems, warm and cozy beneath the insulating layer of white. They too will spend periods in torpor when it gets really cold. Have you ever seen your dog curl up in a tight ball with its tail wrapped around its face? Well, coyotes, foxes, wolves, pretty much anything with a tail will employ the same technique to keep warm while sleeping in the winter. They also use dens to escape from the most brutal cold snaps, happily curled up until the weather breaks. Some birds stay active year-round, including chickadees and ravens. Their feathers and constant movement keep them warm enough during even the coldest nights. Pretty amazing. Deer, elk, and moose spend the winter munching on the tips of trees and shrubs, digging out grasses and other edibles from beneath the snow, and hunkered down in sheltered spots during the windiest and coldest nights to keep alive during the winter. Their thick coats do an amazing job keeping them warm during the deep freeze. Beavers spend most of the winter in their lodges or in homes dug out from river banks, sharing warmth in large family groups. River otters too, live in family groups during the winter, although they remain more active than beavers, their highly insulating fur keeps them plenty warm during even the coldest months. Each animal has adaptations that allow it to survive during the cold and dark of winter in Montana. Whether through conserving energy through hibernating, or bustling about to maintain a core temp that’s high enough to prevent freezing, or combining several techniques, the ability of all year-round Montanans to survive is fascinating. To learn more check out Bernd Heinrich’s fascinating and informative Winter World : The Ingenuity of Animal Survival published by Harper Collins. Check out archived editions of the Rattler here.